The monetary value of jewelry is all over the place. Things we might think are so valuable can be worth mere dollars, and others that look like a simple chain are worth thousands. If you've ever picked up a piece of jewelry off the ground or scored an incredible looking gem at a garage sale, you probably know that feeling of excitement wondering whether or not your sparkly jewel is worth anything. There are a few things you can check for before you fork over money and bring your buried treasure to a jewelry appraiser. One of the first things you can do when you acquire a new piece of jewelry is to look for hallmarks. One hallmark will generally tell us the metal content of a piece, and the other (if there is another) will tell us either the country of origin, designer, or manufacturer. These markings are usually located on the clasp of a necklace, the inside of a ring or bracelet, or the post of an earring. Unless the item is over 100 years old or the hallmark has worn off, all fine jewelry should have some type of hallmark. Common gold hallmarks include 18K, 14K, 10K, 750, 585, 375. Common platinum hallmarks include 950, PLATINUM, PLAT. Common silver hallmarks include 925, Silver, 800, Sterling. There are so many different hallmarks, but the fact that your jewelry has a hallmark at all is usually a good sign. Some valuable fine jewelry hallmarks include Tiffany & Co, Cartier, Tacori. Any of these hallmarks should be appraised for authenticity. Common costume jewelry hallmarks include Sarah Coventry, AVON, & Trifari. These hallmarks indicate your jewelry is a piece of costume jewelry and is not very valuable. Tip: If your item looks antique and it doesn't have a hallmark, get the item appraised. 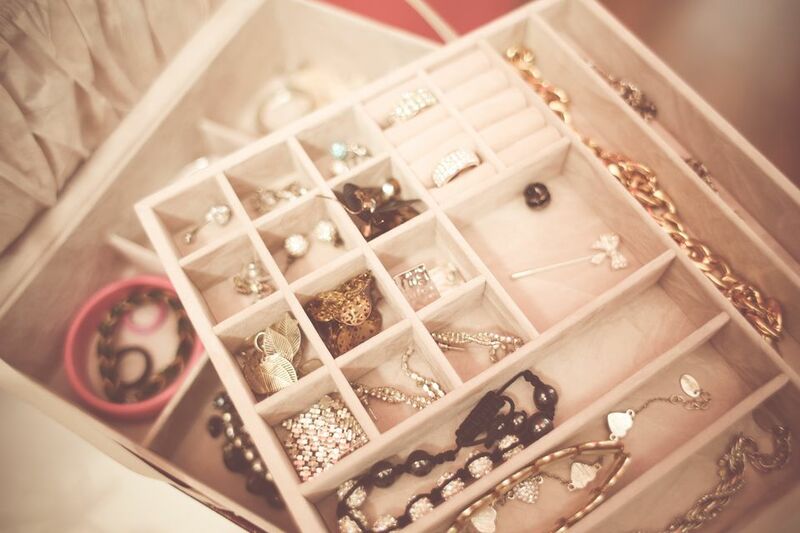 If your item looks new but does not have any hallmarks at all, your item is likely just costume jewelry. This is especially important when you are assessing chains and bangles. Generally gold and silver are heavier metals than their fake counterparts like brass and pewter. If you find a thicker gold chain that feels much lighter than a similar gold chain you have, the chain is likely fake or hollow gold. Fake chains feel fake. Solid gold jewelry is very smooth, heavy and consistent throughout. For instance, if you have a gold colored chain that has a darker color or even a silvery color showing through on parts that see heavy wear, this is likely a gold plated chain and not very valuable. When solid gold or platinum jewelry wears down, the part showing through should still be the same color. This is not the case for white gold. Tip: When determining the value of chains, the longer and heavier your gold or platinum jewelry is, generally the more valuable it is. Some higher quality costume jewelry uses prongs just like in fine jewelry, but a lot of the stones are glued into place. If you have a cameo brooch that looks like it is glued into the setting with no prongs holding it in, this is likely costume jewelry and not valuable. Fine jewelry will be well crafted, with each stone set in an intricate bezel or prong setting, pearls being one of the only exceptions. Tip: Vintage costume jewelry that has a lot of brilliant stones all set with prongs can be very valuable. These pieces can sometimes be as valuable as pieces of fine jewelry. It is important to be sure the piece is vintage, in good shape, and has a lot of brightly colored clean stones all set with prongs.